A federal judge has rejected efforts to reinstall a painting in the Capitol that some lawmakers and police groups found offensive because it depicts police officers with animal heads. David Pulphus, a student artist from Missouri, and Rep. William Clay, his Democratic congressman, had sued Architect of the Capitol Stephen Ayers for removing the painting in January. They sought a preliminary injunction to have the painting restored as the lawsuit proceeds, but the judge denied their motion. On Tuesday, Clay and Pulphus said they would appeal the judge’s ruling. “We believe our Constitution simply cannot tolerate a situation where artwork can be removed from the Capitol for the first time ever as a result of a series of ideologically and politically driven complaints,” they said in a statement. The painting depicts events in Ferguson, Missouri, after a white police officer shot and killed unarmed black teenager Michael Brown in 2014. In a ruling dated last Friday, U.S. District Judge John D. Bates said the government used its editorial discretion in the selection and presentation of the art. As a result, it was engaging in “government speech” and the plaintiffs have no First Amendment right to display the painting at the Capitol. The First Amendment limits government regulation of private speech, but it does not restrict the government when it speaks for itself. Duncan Hunter holds a press availability at the Congressional Art Gallery after taking down a high school student’s painting depicting Ferguson, Mo. Bates said he was “sympathetic” to Pulphus and Clay given how the artwork was treated, but he concluded that they were unlikely to succeed on the merits of their arguments. He also noted that all of the paintings in this year’s arts competition are to be taken down May 1, less than two weeks away. Clay and Pulphus had sought a preliminary injunction to have the painting restored to the tunnel that connects the Capitol to a House office building. That’s where hundreds of winning paintings in an annual Congressional Art Competition are hung. Ayers made the determination after Rep. Dave Reichert, R-Wash., a former sheriff, asked him to remove the artwork, calling it a “slap in the face” to those officers who put their lives on the line to provide safety and freedom. The painting had hung from early June to late December before conservative media outlets and lawmakers began to weigh in. Soon, Rep. Duncan Hunter, R-Calif., removed it on his own. Clay put it back up, and the scenario was repeated when two other lawmakers also removed the painting. 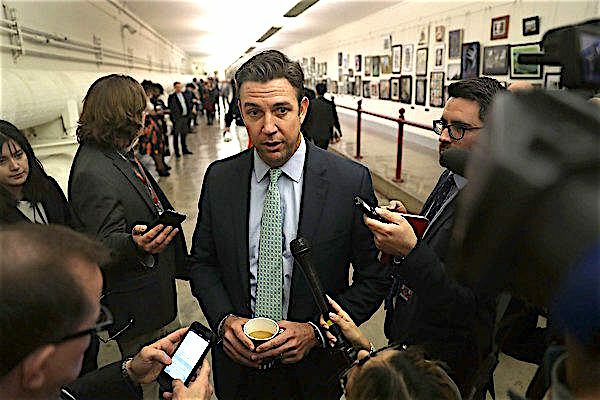 Following Clay’s legal action in February, Republican Rep. Duncan Hunter, who was at the center of efforts to remove the Ferguson painting, told the St. Louis Post-Dispatch that “it kind of strikes the same nerve as when the guys came home from Vietnam, and they called them baby killers,” adding that Capitol Hill police officers thanked him for his actions. Pulphus, now a college student, has only spoken of the painting via a January opinion piece published in the Post-Dispatch. “Why would a young student with hope, promise and purpose perceive our community and the police in such a manner?” he wrote. Discontent in Ferguson that followed Brown’s shooting – and later in the year, a grand jury decision not to indict the officer involved, Darren Wilson – was met with an aggressive militarized police response. Brown’s killing set off nationwide protests of systemic racism and police violence against minority communities. 1 Comment on "Judge rejects effort to reinstall painting taken down by Hunter at U.S. Capitol"
In response to this ruling every Democratic congressman should remove a piece of artwork they don’t like if it was placed on the wall by a Republican congressman and then deliver it to their office. They should repeat this process until such time that the suitability of each and every piece of artwork on display is judged appropriate (or inappropriate) by the AOC. These are now the rules according to the Republicans, the AOC and the courts and now everyone needs to play by them.